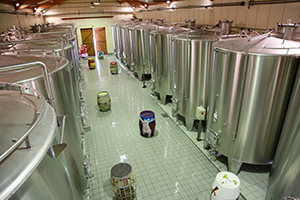 The wine fermentation takes place in stainless vats that guarantee the utmost hygiene. They allow the grapes from each different soil or vine type to be made into wine separately. The thermo-regulation equipment means that the temperature can be precisely controlled throughout alcoholic fermentation and long maceration, before the wine is put into barrels. We develop our wine in a very traditional manner, by stirring it each day, to aid the aeration. This is in order to maximise the extraction of the colour and tannins, two of the traditional components of Cahors wine, whilst at the same time preserving the aromas and character of the grape. The barrels are stored in the cellar at the chai, where, being underground, they are kept naturally at the ideal temperature and hygrometry for the maturing of the wine in a cask. Finally, it is possible to store the entire harvest, once bottled, at the chai – that’s 250.000 bottles. 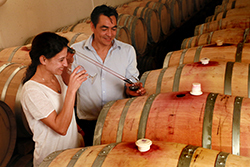 Visiting us, you will be given a warm welcome in the tasting cellar of the CHÂTEAU SAINT-SERNIN and a guided tour. We will be pleased to see you.